Big Night Entertainment is best known for its large format restaurants with impressive décor and pumping Friday and Saturday nights. Empire, in the Seaport District, the group’s most recent venture, runs along these lines, but offers more serious diners an opportunity to enjoy some tasty food on quieter weekday evenings. The Asian restaurant and lounge boasts a 14,000-square-foot space, large even considering the Seaport’s population of large, conference-friendly eateries. 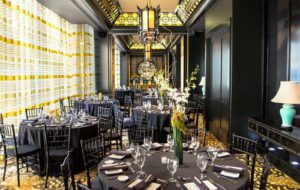 From the Great Wall Gallery to the Persimmon Room, Empire features nine distinct and opulent private dining spaces in addition to its bustling bar. As massive as this restaurant is, seating 350 people, it can often be difficult to get a table Thursday through Saturday evenings. The bar itself is packed with a see-and-be-seen crowd; fueled by Empire’s creative cocktails, it makes for a lively evening to say the least. Something very different, however, is offered on Monday evenings — indisputably the “off night” in the restaurant industry. 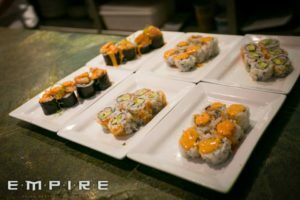 Mondays at Empire offer diners a quiet, tranquil evening of delicious sushi at an excellent price. 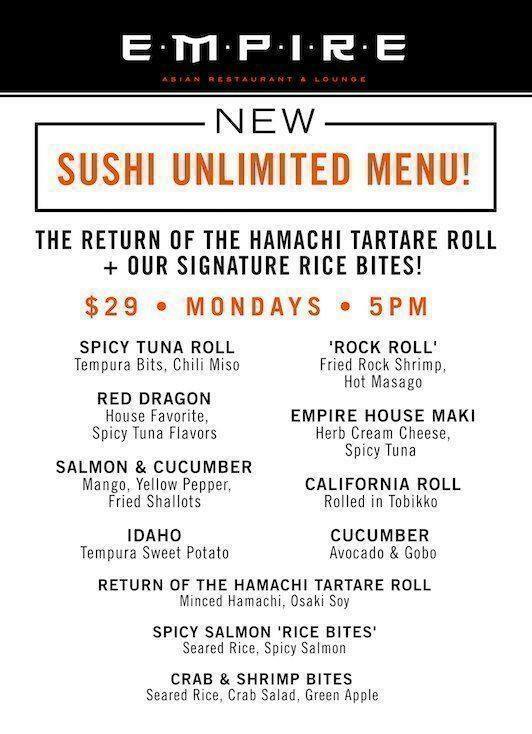 For $29, a special part of the sushi menu is available in “unlimited” format. Although all-you-can-eat sushi doesn’t always scream quality, at Empire, the sushi is not only excellent, it is creative as well. The sushi chefs, led by executive chef Kevin Long, take their craft seriously, as does the wait staff, who are informative and efficient. Classics like the spicy tuna, red dragon, and tempura sweet potato rolls are all so good you will want to keep them coming (and you can). Other more signature items like the Empire House maki (herb cream cheese and spicy tuna), the Return of the Hamachi Tartare, and the spicy salmon bites (spicy salmon atop lightly fried beds of sushi rice) are all worthy of a round…or three. Conveniently, the rolls come in smaller-than-usual sizes, so you can try more options on the unlimited menu, and you can measure your appetite as you go, so there’s no need to over-order and waste food. Other menu items are also available to order. The wrinkled green beans are a must, and the sushi cupcakes — deep-fried and stuffed with crab meat, shrimp, and roe — though perhaps not the lightest item on the menu are far outside the realm of a usual sushi repertoire. For a sushi tasting, I usually stick to sake, and the sake menu at Empire is among the stronger ones I have seen in Boston. There is nothing quite like a good cup or two of Japanese rice wine to refresh the palate in between bites. Although Empire is one of the places to be in Boston on the weekends, I would recommend experiencing the restaurant on a quieter evening. The interior is beautifully executed and the food is really worth your full attention.